If you have an existing account with us, simply Sign In with your username (email address) and password. Once logged in, click the "Manage" link at the top of the website to view / modify your account details. Please contact us if you require further assistance, remember to provide your email address, full name and contact number so that we may verify your identity. All enquiries are handled with strict confidentiality in accordance with our Site Policy. I have created a new account but cannot Sign In. Help! All new accounts must be verified before you can sign in. A verification email is automatically sent to you upon signing up - while usually this email is received within a few minutes, sometimes this delay may take longer. Also, some email services may incorrectly flag emails from mailordersoftware.com.au as spam / junk mail, so please check there also. We ask you to wait for 48 hrs before contacting us with your problem, and one of our sales staff will promptly look into it for you. How can I order a product that is not listed on your website? It is our goal to satisfy your needs even if the item you're looking for isn't listed on our website. Please send your product request to us via the Contact Us page. 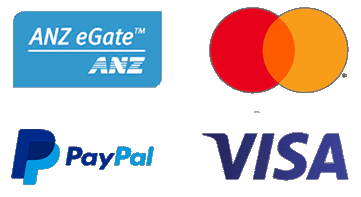 All online orders are processed securely via PayPal Australia. Note you don't need to create a PayPal account if you are paying by credit card. PayPal accepts Visa, MasterCard credit cards, as well as bank transfer and PayPal credit. Please contact the store if you wish to organise alternative payment. Yes, we are happy to ship products worldwide, however, please note that the freight charges will vary from what is quoted on the website. Therefore, we ask you to send us a product enquiry regarding the product and we'll quote you the charges accordingly. Yes, our website is secured with the strongest Extended Validation (EV) Secure Socket Layer (SSL) encryption available today. SSL prevents prying eyes from seeing sensitive information that's transmitted between you and the website. You will see a padlock icon at the bottom right of every webpage - place your mouse over it to see the certificate. When you visit the Shopping Cart or Check Out, your web browser will automatically display a padlock image (with a special green background on newer browsers) which further identifies the SSL connection is active. Also the PayPal payment gateway is secured with the same SSL technology. We are a Melbourne based company. Our store and operations are located in Melbourne. We sell Australia-wide and internationally. Yes, you can pick up during our normal trading hours. Please specify on your order that you wish to arrange pickup and we can organise this with you. Are your products new and original? All our products are brand new condition. We sell originals, backed by full manufacturer warranty. Generally yes, it depends on the quantity and delivery location. Simply drop us an enquiry and we'll get back to you! Yes, we are committed to giving you the best brands at the best prices ... ALWAYS! If you find a competitor with a lower price*, then we will beat that price no worries. Just send us an enquiry and we'll get back to you right away (usually within 24 hours). * Trade price excluded. Items must be in stock and with prices current and in writing.